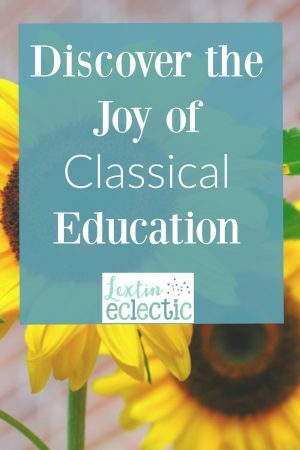 As part of my little mini-retreat and time of teacher training, I listened to The Joy of Classical Education by Susan Wise Bauer. It was excellent-very insightful with lots of practical information and application. It is a wonderful overview of the classical model and how to implement that model in your home. While I typed out multiple pages of notes, I want to share just a few things that stood out to me as I listened. Some would equate classical education with a joyless education – one that is full of memory work, analyzing difficult literature, and writing compositions. Well, the classical education is certainly not easy but the end product is worthwhile and the journey doesn’t have to be without joy. It’s true, not all learning is fun. Learning is challenging and is a long-process. A classical education requires self-discipline and guidance from the parent who knows the end result. Boredom should not exist in the classical model-students should be continually challenged to dig deeper, analyze thoroughly, and examine cause and effect. The challenge of classical education will look different at each stage of learning. In the classical model there are three stages of learning: grammar stage, logic stage, and rhetoric stage. At this age children are collecting facts on which to build their foundation for future learning. These children have a large capacity for memorization and they thrive with routines, patterns, repetition, structure, and sameness. They are concrete learners who cannot think in abstract principles. They need to be given large amounts of information without being required to analyze them or make judgements about them. Logic stage children are able to begin to think abstractly and to analyze information. This phase happens anytime between 4th – 8th grade and is different for every child. Some children enter the logic stage in one subject area while still being in the grammar stage thinking in another subject. At this age students ask the “Why?” question and try to determine the cause and effect relationship between people and events. After a child moves through the logic stage of asking thoughtful questions, he is ready to begin forming his own opinions about the information he has gathered. Rhetoric students are ready to discover their own identity and determine how they will respond to the material they have learned. At the rhetoric level, a student should be allowed to follow his passions and study topics of interest. These students are able to read, analyze, form an opinion, and then defend their belief. As you progress through each stage of the classical model, never forget the end goal of this style education. The goal is not to produce a scholar but a student who is articulate, well read, and able to research and find information. A classical education should produce a student who has discovered his passions in learning and is interested in learning. If you’re focused on the end result of classical education, you will not miss the joy in your journey. Great post. I am a firm believer in Classical Education and wish I had known about it when I first began homeschooling. Oh well, live and learn, right? I like the concept of Classical Education. I'm too eclectic in nature to stick to just it though. But I am doing the foundations (basically grammar stage) with my kids in my own way. My copy of The Well Trained Mind sits on my desk!